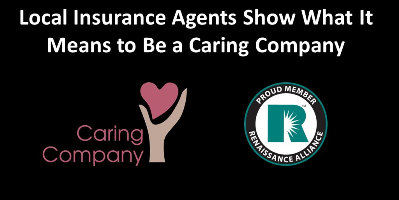 When it comes to volunteering, we tip our hat to our Renaissance Alliance Member Insurance Agencies! For yesterday’s Giving Tuesday, we were pleased to highlight some of the charitable efforts of Renaissance Alliance members at our Caring Company blog. Renaissance insurance agents are local agents, living and working in the communities they serve. As such, community involvement is a strong value! Take a minute to check out some recent initiatives by our member agencies, along with links to the organizations they support and galleries of staff photos. These are just a small sampling of recent charitable and community events that came to our attention. The annual Giving Tuesday event is a great tradition and reminder of the importance of community service — but supporting our communities and charitable endeavors should really be a 365 day a year priority for us all! In all the gift giving of the holiday season, it’s great to set aside some time and money for those who are less fortunate or who have special needs. Follow Caring Company on Twitter! We also keep a list of New England nonprofits on Twitter and add to it regularly, if you know of one we should add, let us know. You can subscribe to that feed, too – we encourage you to support and retweet local nonprofit activities, fundraisers and volunteer opportunities on your own Twitter account!